Erin Martin admittedly has a loud personality. And she’s not afraid to show it in her new shop on the east side of WaKeeney. If the zebra-print doormat outside her store isn’t proof enough, just step inside. Neon pink, lime green and more zebra print adorns the walls and many of the items at e.m. Fashions. “Pretty much everything is zebra, and luckily you can find it in 500 million different colors,” Martin said with a laugh. She started by making one shirt in her home and posting it on Facebook. “Before I knew it, my phone was ringing off the hook,” she said. She soon had to find a place to work outside her home, and was offered the opportunity to take over the front portion of the former Pro Auto Glass and Collision on 13th Street. She moved into the shop in mid-November and has hardly had a chance to breathe since. Martin’s designs include T-shirts, dish towels and fleece blankets. She adds a personal flair — usually a zebra print — to each item to make it unique. Using stencils she makes from fonts and designs she finds on the Internet, she cuts out fabrics and irons them onto shirts and other items. She then sews around the designs and usually adds jewels. “Pretty much whatever the computer will let me print off is pretty much how it works,” Martin said. 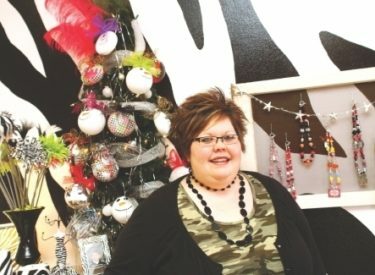 She said she’s always been crafty, and she hopes to pass along her passion to local children beginning in late January when she plans to start offering craft classes for boys and girls on Saturdays. Martin said shirts are made as ordered at e.m. Fashions, but she has other handmade items such as blankets, decorations and frames as well as consignment items such as jewelry and purses available in the shop. She said she’s appreciative of the support her husband’s hometown has given her in her new endeavor. “If it wasn’t for them, then my doors wouldn’t be open,” Martin said.